Mother’s Day is just around the corner and lots of us will share precious photographs of our children or a sweet Mother’s Day printable as a gift. But instead of gifting a plain frame jazz up the mat with this easy tutorial for a DIY Picture Frame Mat. 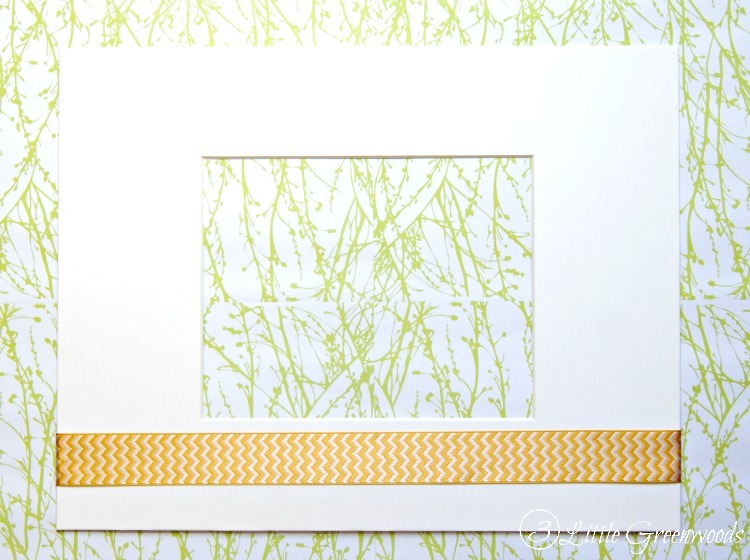 Large white frames are a blank canvas for adding personality with a colorful ribbon. Just four simple steps will take a plain, white mat from boring to wow! This post may contain affiliate links marked with an asterisk. Click here to see my complete full disclosure policy. 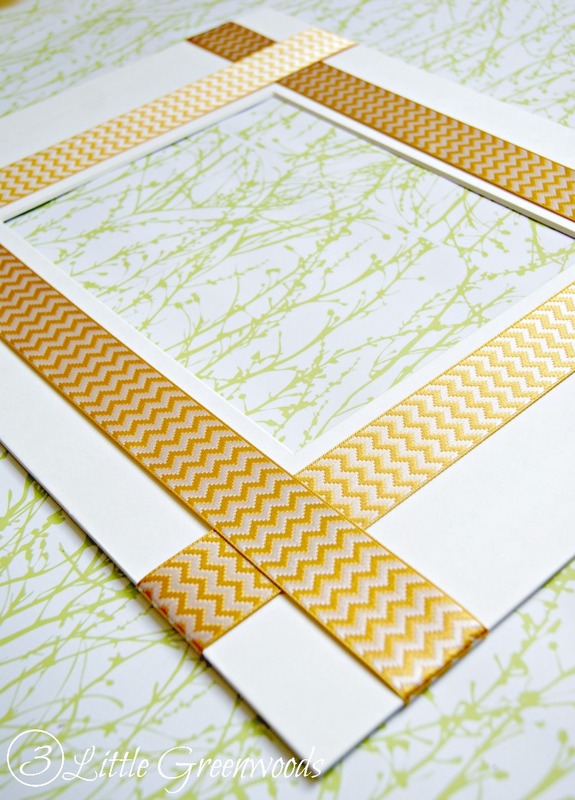 Start with a basic Large White Frame with Pre-Cut Mat* . The 11″x14″ frame with an 8″x10″ photograph opening is perfect for this DIY Picture Frame Mat project. 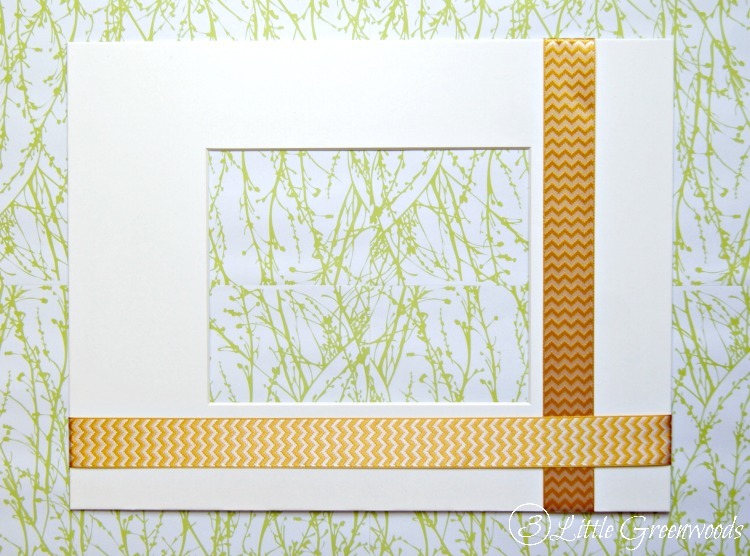 Choose your favorite ribbon to create a frame around the photograph opening. 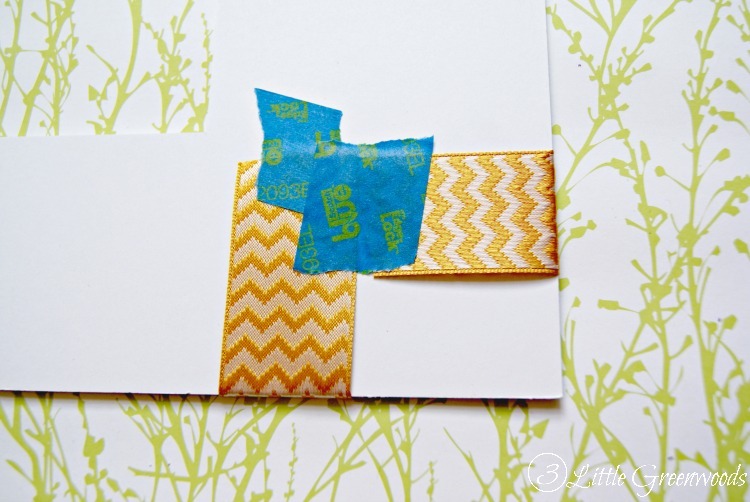 The yellow chevron ribbon used for this project is 1 1/2 inches wide. The width of the ribbon you will choose depends on the size of the pre-cut mat. The wider the mat then the wider the ribbon. Begin the ribbon frame by cutting a piece of ribbon that is 4-6 inches longer than the width of the mat. Align the ribbon along the bottom of the frame about 1/2″ from the bottom of the photograph opening. Secure with tape on the back. Cut a second piece of ribbon that is 4-6 inches longer than the height of the mat. Weave it underneath the first ribbon and secure with tape on the back. Using painters tape to secure the ribbon on the back will allow the ribbon to be easily changed or removed completely. Follow the same steps to complete the ribbon frame all the way around the photograph opening. When you are finished you have a unique ribbon frame that surrounds the print or photograph of your choosing. 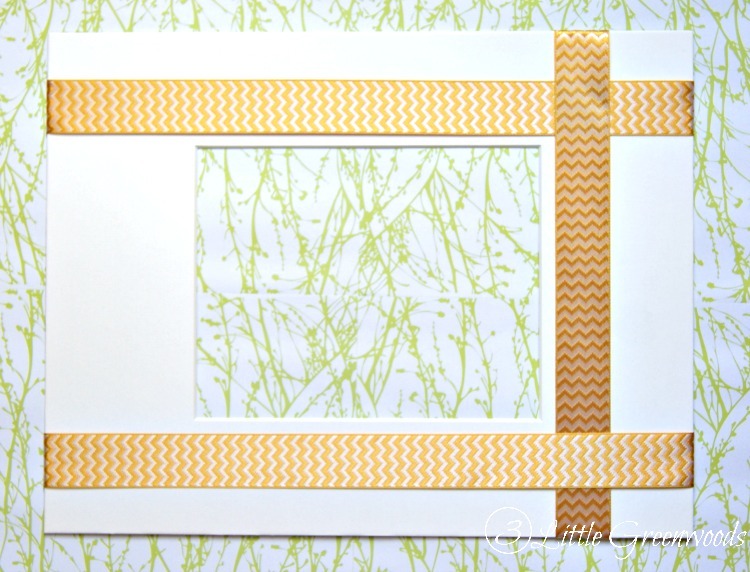 I love how the yellow chevron ribbon coordinates with the small yellow flowers in the Mother’s Day Printable. 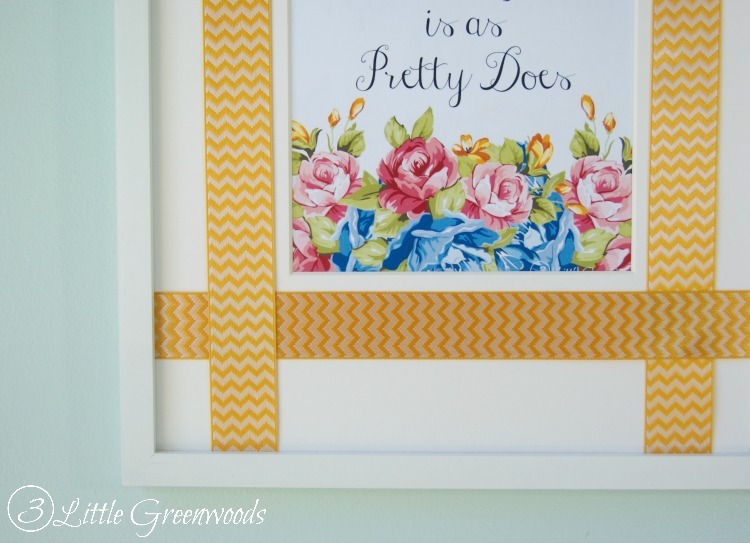 It’s amazing what a little bit of ribbon can do for a plain white frame! 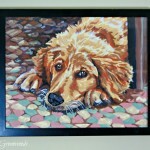 Just think of how you can personalize any picture frame mat by adding your favorite ribbon. 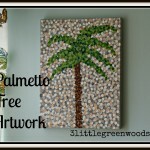 I hope you have been inspired with these DIY Picture Frame Mat Projects. They are a fun and fast project that at is sure to bring a little color to basic white frames. 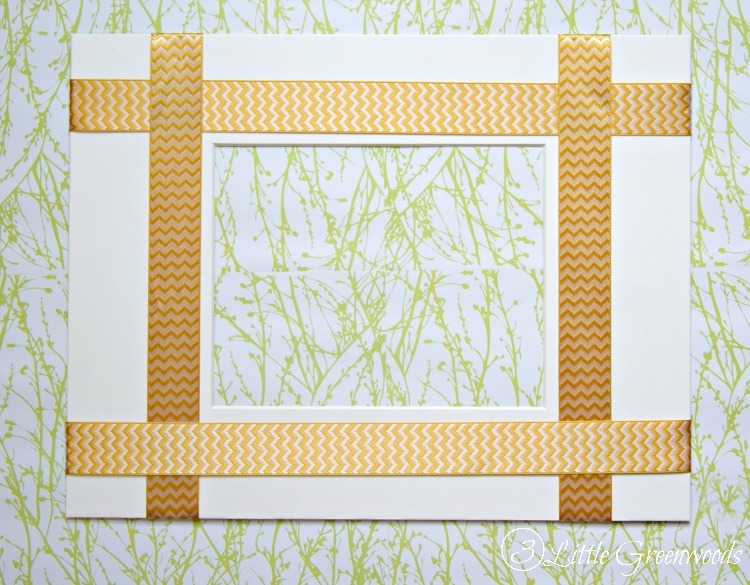 Adding ribbon to a pre-cut mat is an easy way to personalize a DIY Picture Frame Mat. In a few simple steps you can transform a simple white frame into something fabulous! 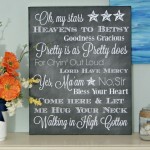 Which one of these picture frame mat projects would you like to try? Wow, what an awesome idea! Simple yet so beautiful and makes such thoughtful gifts! 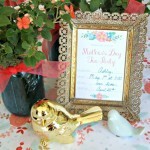 I think I will try these with the kids to make frames for their grandmas with their pics! Thanks so much for sharing! 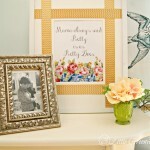 All the grandma’s will love this DIY frame! Thanks for the comment love! It is amazing what a little bit of ribbon can do. This looks so professional and beautiful. I love this! My mom is constantly changing around her living room so a new one every year to match her current decor would be a great idea. Thank You for sharing, this is awesome. It’s pretty awesome that the ribbon can be changed for another pattern or totally removed! I love simple DIYs! It’s amazing how you turned that plain white frame into a truly work of art! I like simple crafts (like this one) that have a huge impact. Well done!! SO easy and so cute! 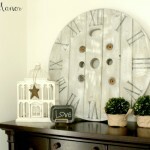 I’m going to make a few of these for my daughters room! That would be a wonderful idea! These DIY picture frame mats are an awesome way to add color to any space! Love how simple and easy this is! I’ve decorated and repainting frames before but never thought to decorate the actual picture mats. Thanks for sharing. YAY! So excited that you like my simple DIY! What a cute idea, perfect for Mother’s Day! I love the ribbon accents. I love the color the ribbon adds to the plain frame. Thanks so much for the comment love! I really like the touch of ribbon! Why did I never think of that? LOL. I had a quote I wanted to frame but I think I will look for a pretty lace ribbon to add to it, perhaps not as a complete border but run across the bottom. Thank you for sharing! Great idea, Pascha! Thanks so much for the comment love! Just adding that ribbon made a huge difference! What a good idea! I might try a very simplified version of this with my students for their Mother’s Day gift. Great idea, Lisa! What grade do you teach? 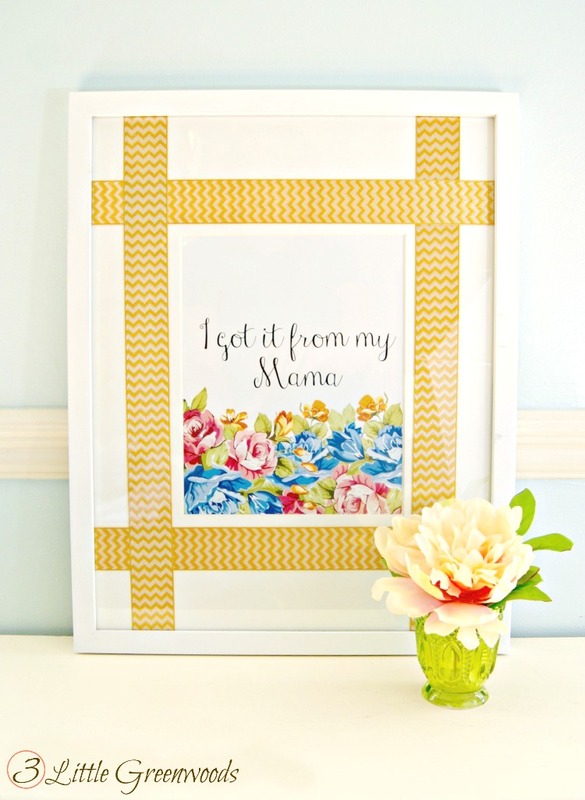 OK, that “I got it from my mama” print is THE CUTEST. I might need to go all DIY and make one for my momma this weekend!